The world remembers the allied forces' landing in Normandy on June 6, 1944, during World War II. Cpl. Jack Schlegel, who parachuted into Normandy at 19 and once had a drink with Gen. George Patton, has died at the age of 90. 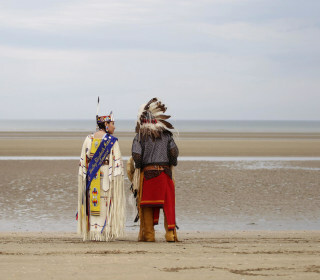 Descendants of Comanche Indian soldiers gathered to pray on Utah Beach on Monday in Sainte-Marie-du-Mont, France. 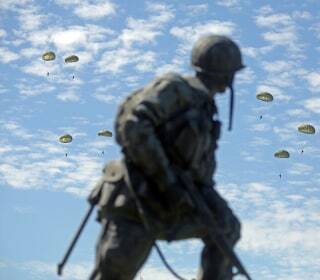 American and French paratroopers made a special jump to celebrate the mission to save France from Germany’s clutches 70 years ago. But for Francoise Piloy, the anniversary of D-Day inspires a mix of pride and pain at her role in history: a generation born to GI's who simply disappeared. See rare pictures from Normandy taken by a U.S. Army technician who carried a Kodak camera onto the battlefield. 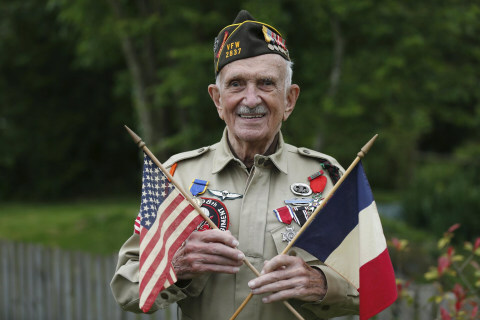 World War II veteran Thomas Macdonnell was part of the initial assault force on Omaha Beach, and has traveled back to Normandy 70 years later. Some 3,000 veterans are among those attending ceremonies in northern France to mark the anniversary of the June 6, 1944 invasion. In 1984, on the 40th anniversary of D-Day, Tom Brokaw met with World War II vet Leonard Lomell to discuss what some had called a "suicide mission." Flags flew at half staff on Omaha Beach, which U.S. troops had the responsibility of assaulting on D-Day. Ukraine president-elect Petro Poroshenko and Russian President Vladimir Putin came face-to-face during a group photo Friday. In honor of this historic 70th anniversary, share your tributes to loved ones who heroically fought on June 6, 1944. The White House said Obama and Putin had had "an informal conversation" on the margins of a lunch attended by world leaders. Veterans who fought on D-Day returned to Omaha Beach and other key sites of World War II with students from College of the Ozarks. During World War II, a note added to the familiar NBC three-chime signal rang out during major news events, including D-Day. Millions of Americans tour the sites of D-Day, launched 70 years ago today. The vast majority were not yet born. Somber reasons entice them to come. C-47 pilot Bud Rice shares his memories of the D-Day invasion. He recalls the training, test runs and heavy fog that accompanied the mission. Marking the 70th anniversary of D-Day, car enthusiasts traveled all across Europe to the beaches of Normandy to show off their prized possessions. A photographer visited the sites where pictures were taken during the 1944 D-Day invasion to capture them as they appear today. A documentary titled "D-Day's Sunken Secrets" explores the underwater wreckage left behind by the Allied invasion of Normandy during World War II.